Middle Columbine Trail (as the name suggests) sits in the middle of North Cheyenne Cañon’s much longer Columbine Trail. From Middle Columbine Trail, you can climb up (continue along Upper Columbine Trail) and finish at Helen Hunt Falls. Or, you can hike down to the Starsmore Visitor and Nature Center via Lower Columbine Trail. Jump on the trail heading west, climbing up and you’ll be on your way. And up is pretty much what you’ll get. Even though this will be a short hike, it’s going to give you a good workout. If you like switchbacks, you get to experience both long, and short versions on this trail. After crossing a sturdy bridge, the trail begins to climb quickly, frequently changing directions as you gain elevation. Towering rock formations reach above you, along with great views of the canyon below. There are even some popular rock climbing spots near this trail, so you might see some climbers too. There are sections of this trail that have washed out causing the trail to become quite narrow. Along with the loose granite gravel, you can easily slip. So if you’re hiking with little ones, be sure to keep them close...it’s a bumpy slide to the bottom. Even though it might not seem like it, after so much climbing, the trail will eventually level off. When the path transitions from open views to shaded forest, you’ll be close to the Spring Creek Trail junction. If you’re looking for a longer hike, continue past the junction, and you’ll soon be on the Upper Columbine Trail. If you’re only in the mood for a short hike, this is a good spot to rest for a few minutes before making your way back down. With all the switchbacks, and fast elevation gain, Middle Columbine Trail makes you work for it. 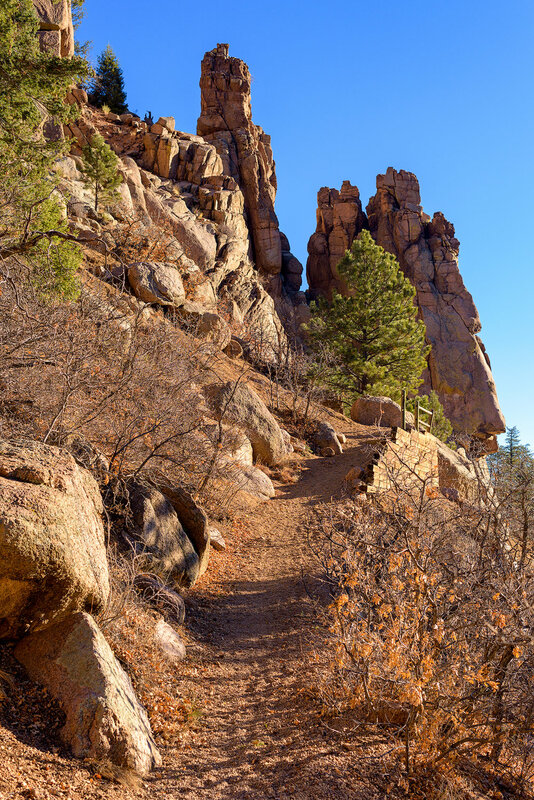 If you’ve never hiked in North Cheyenne Cañon before, give this one a try...it just might whet your appetite for more like: Mt. Cutler Trail, Mt. Muscoco Trail, or Seven Bridges Trail.